Welcome to Alegria Norwich Terriers located in Central Texas. We hope you enjoy your visit with us. We were introduced to the Norwich breed after much research and meeting several breeders and owners. We fell in love with them from the beginning as they poured out a door to greet us. Our first, Staci, showed us just how much joy and magic this breed brought. She has also been the best family member you could ask for. We have since expanded our family in showing and loving Norwich as well as introducing others to this wonderful world. We found the name Alegria (ah lay GREE ah) from a Cirque du Soleil show by the same name. Just like the show, our Norwich instill that same magical, joyous feeling into each of us and those we have been fortunate to touch. So we thought there was no better name for our Norwich home than Alegria. 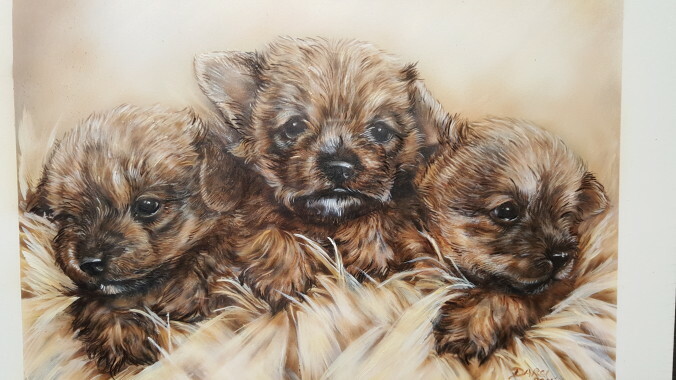 It is our wish to have the healthiest, highest quality Norwich Terriers we can. Our kids have a CHIC number, passing health tests for eyes, hips and patellas. Each and every one is a family member above all. Again welcome, and we hope you enjoy your visit.